Human rights groups have urged Qatar to free a poet detained last year for what they say was peaceful criticism. Mohammed al-Ajami is reported to be facing a secret trial on charges of "inciting to overthrow the ruling system" and "insulting the emir". 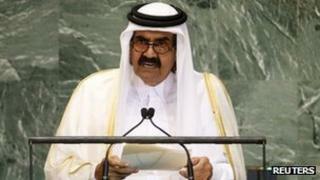 The case against him is said to be based on a poem he wrote in 2010 which criticises Sheikh Hamad Al Thani. But activists believe the authorities were angered by a 2011 poem he wrote about authoritarian rule in the region. In the poem Tunisian Jasmine, which he recited and then uploaded to the internet in January 2011, Mr Ajami expressed his support for the uprising in the North African state, saying: "We are all Tunisia in the face of the repressive elite." Mr Ajami, also known as Mohammed Ibn al-Dheeb, had previously recited a poem that criticised Qatar's emir and was posted online in August 2010. In November 2011, Mr Ajami was summoned by Qatari state security in Doha and arrested. He was then allegedly held incommunicado for months before being allowed family visits, and remains in solitary confinement in the capital's Central Prison, Amnesty International said on Monday. The human rights group said Mr Ajami's trial has been marred by irregularities, with court sessions held in secret. His lawyer reportedly had to provide a written defence of his client after being barred from attending one of the court sessions. Last week, a judge postponed Mr Ajami's trial for the fifth time. He next trial hearing is now scheduled for 29 November. The charge of inciting to overthrow the ruling system carries the death penalty under article 130 of Qatar's penal code. Insulting the emir carries a five-year prison sentence. On Tuesday, Human Rights Watch said there was no evidence that Mr Ajami had gone beyond the legitimate exercise of his right to free expression. Article 47 of Qatar's constitution guarantees freedom of expression and opinion "in accordance with the conditions and circumstances set forth in the law", and the country has pledged to respect the right of free expression as a party to the Arab Charter on Human Rights. "Qatari authorities must ensure that legal proceedings against al-Ajami are carried out in accordance with international fair trial standards and that any charges which relate solely to peaceful criticism, even if it is of the highest authority in the country, are dropped," said Philip Luther, Amnesty's Middle East and North Africa programme director. Human Rights Watch also called on Sheikh Hamad not to approve a draft media law unless "loosely worded provisions penalising criticism of Qatar or neighbouring governments" were removed. Although the legislation calls for abolishing criminal penalties for media law violations, article 53 prohibits publishing or broadcasting information that would "throw relations between the state and the Arab and friendly states into confusion" or "abuse the regime or offend the ruling family or cause serious harm to the national or higher interests of the state". Those who violate the law would face fines of up to $275,000. "The draft law builds in a double standard on free expression that is inconsistent with Qatar's claims to be a centre for media freedom in the region," Human Rights Watch said. The Qatari government set up the Doha Centre for Media Freedom in 2008 to promote press freedom and quality journalism, and is home to the pan-Arab satellite TV network al-Jazeera.